Obstructive Sleep Apnea (OSA) is a condition in which a patient's muscles and tissues in the throat and air passage relax while sleeping, and this impedes the flow of air into the lungs due to a blockage of the airway. This can occur many times per night in the sleep cycle and especially during the REM sleep stages. Apnea is Greek for "without breath." The scientific standard of an apneic event is the patient must stop breathing for at least 10 seconds per event and have an overall blood oxygen desaturation level of 3 % to 4 percent along with certain potential changes in EEG frequencies and data. If a person has 5 or more of any type of events per hour of sleep then they can be clinically diagnosed with Sleep Apnea. According to the American Sleep Apnea Association, Sleep Apnea affects roughly 22 million Americans, with roughly 80% of those individuals being undiagnosed. If a person suspects they have Sleep Apnea, one should consult with a physician or medical professional for a diagnosis. Obstructive Sleep Apnea is the most common type of Sleep Apnea, and is caused by the tissues of the mouth and throat relaxing during sleep and collapsing back into the airway. This causes the airway to become blocked, and the blockage prevents oxygen from being able to reach the lungs. As a reaction to the lack of oxygen, the body goes into fight or flight mode, and the person wakes up in order to breathe. Over the course of the night, this process repeats itself over and over again and the person doesn't get much quality sleep. This lack of sleep raises blood pressure and causes cardiac issues, along with many other health problems. With Central Sleep Apnea, the cause isn't necessarily an obstruction of the airway. With those suffering from Central Sleep Apnea, the brain doesn't send the signal to breathe, and as a result the person may go for as long as 10 seconds before drawing a breath. Eventually this lack of oxygen causes the person to wake up and the process repeats. Central Sleep Apnea is sometimes caused by shallow breathing that gets shallower until finally the person doesn't draw any breath. This phenomenon is called Cheyne-Stokes Breathing and is sometimes found in people having congestive heart failure, aFib or other serious cardiac impairments. Central Sleep Apnea can also be caused by altitude or elevation, and can be found in people taking opioid painkillers. In the third type of Sleep Apnea, Complex Sleep Apnea, the cause is both related to Obstructive Sleep Apnea and Central Sleep Apnea. It is a hybrid form of Sleep Apnea, and was only recently discovered in 2006. The Mayo Clinic found in some individuals effective CPAP therapy alone isn't enough to resolve a person's issues. Further investigation revealed these people were not getting the signal to breathe at times during the night, and this was the reason they weren't recovering from Sleep Apnea even though the Obstructive Sleep Apnea was being adequately treated. There are a few different treatment options for Complex Sleep Apnea, one of which is ASV, or Adaptive Servo Ventilation. ASV machines monitor breathing and adapt to different breathing patterns, helping keep the patient on track during the night. Sleep apnea is a serious and potentially fatal medical condition. If you or a loved one suspect you have it, you should be tested as soon as possible. Sleep Questionnaire. This is a simple test you can fill out and take with you to your physician visit. It evaluates you for the most common symptoms of sleep apnea. Sleep Study. A polysomnogram, or sleep study, measures many key metrics while you sleep. These metrics are used to determine if you have sleep apnea or a number of other sleep related conditions such as central sleep apnea or restless leg syndrome. Get The Best Equipment. Watch Out! There is a significant difference between basic and high end CPAP equipment. High end equipment is generally smaller, lighter, quieter, less prone to leaks, easier to breathe against, better humidified and easier to travel with than basic CPAP Equipment. The key to CPAP treatment is comfort, choose wisely! Many traditional, brick and mortar CPAP providers will set you up on a CPAP and bill your insurance company. If this approach to getting your equipment is used, you will most likely be given basic equipment. This is because there is only one billing code for all CPAP Machines and very few unique codes for CPAP Masks. Due to this, the insurance company will pay your CPAP Provider the same amount if you get a high end or basic machine. Usually, the amount paid to traditional CPAP providers by insurance companies is not enough to cover the cost of high end CPAP equipment and the patient is left to make do with basic equipment. If you would like high end equipment, there are a variety of ways to obtain it online for equal or lesser cost than dealing with traditional CPAP dealers. CPAP.com (CPAP Retailer). CPAP.com sells high end CPAP supplies and equipment direct to consumers. Many times buying with cash is less expensive than the copay and deductible charged through insurance. If you want a way around the hassle and low end equipment provided by insurance companies and local providers, this is a good choice. A person can die from every single one of these conditions, and it's important to understand Sleep Apnea's role in causing these issues. Sleep Apnea deprives a person of blood oxygen during the night, and as a result, the lack of oxygen puts extra strain on the heart. The extra strain on the heart can raise blood pressure and make it very difficult to control. High blood pressure can cause heart attack or stroke, and has its own set of complications. If concerned about possibly dying from Sleep Apnea, it's important to work with a care provider to help get it under control. When controlled, many of the cardiac symptoms can lessen and a person's energy level and overall health can dramatically improve. Is there a sleep apnea assessment quiz? Yes, the link below will take you to a questionnaire designed to evaluate the most common symptoms of sleep apnea. This quiz may be a useful tool for discussing your symptoms with your doctor and can be taken to your appointment. How do I explain sleep apnea to my partner or family? What is the History of Sleep Apnea? Sir William Olser in 1918 first used a term he invented, "Pickwickian", to describe patients who were both obese and hyper-somnolent. Olser was obviously a reader of Charles Dickens as the Dickens novel Pickwick Papers had a character in it that was similar to the patients he had identified with these common symptoms. Around 1956, Dr. Burwell was treating patients who often had congestive heart failure, extreme sleepiness or fatigue, as well as improper airflow to the lungs; or respiratory failure. He termed these types of patients as having Pickwickian Syndrome. In 1965 a group of French and German doctors lead by Dr. Gastaut started doing research on what is now called Obstructive Sleep Apnea, and recorded breathing and sleeping patterns of a patient with Pickwickian Syndrome and discovered distinctively unique patterns of the 3 types of apneas. 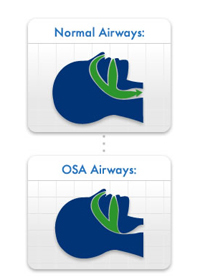 Beginning in 1969 OSA (Obstructive Sleep Apnea) was often treated with a tracheostomy; bypassing the upper air passage altogether by creating an incision or opening in the trachea (windpipe) and inserting a breathing tube. In 1981, an Australian researcher by the name of Dr. Colin Sullivan and his colleagues Berthon-Jones, Issa and Eves, introduced their findings on the treatment of OSA with something called a Continuous Positive Airway Pressure machine, or CPAP. The treatment plan started off with a reversed vacuum cleaner motor that blew air into the afflicted person's nasal passage using a Silastic tubing to keep the airway open. The initial CPAP machines were large, bulky and noisy but by the late 1980s many improvements had been made to the machine and masks and soon this became the preferred method of treatment for those who suffer from Sleep Apnea. The publishing of their research papers was a landmark development in the treatment of Sleep Apnea. I have been diagnosed with sleep apnea, what should I do? Get The Best Equipment. For effective treatment, the CPAP equipment must be used nightly. Because of this, selecting the most comfortable equipment and mask possible is advisable. Our company provides a low cost, hassle free alternative to the stress and risk of dealing with private insurance and traditional providers to obtain CPAP equipment and supplies. Get Support and Information From Other CPAP Users. The prospect of adjusting to CPAP therapy can be daunting. You are not alone. The online CPAP Community cpaptalk.com is a free, no registration required resource where CPAP users from all over the world gather to ask questions, provide encouragement, review CPAP equipment and stay up to date on the latest treatment techniques and options. Replace Disposable Equipment Regularly. CPAP filters should be replaced following manufacturer's guidelines. In general, disposable or fine filters should be replaced once a month. Washable, or foam filters, should be rinsed with clear, running water once a week and allowed to air dry and should be replaced every 6 months. Expect a CPAP mask to remain effective for about six months. Sinus infections and nasal congestion often result from the failure to care for and replace disposable equipment regularly. Use our Replacement Part Wizard to identify your machine or mask and see all the related parts. Replacement Reminder Emails. CPAP.com offers equipment replacement reminders to help you maintain healthy functional therapy. After placing an order with our company, you will be given the option to have email reminders sent to you. Select the desired time frame for the reminder email allowing you to "order it and forget about it". Edit reminder setting at Product Reminders in Your Account. Stay Informed. The market for CPAP goods and services is competitive and dynamic. Manufacturers are frequently coming to market with products that make CPAP therapy more comfortable and effective. You do not want to be stuck using an inferior product or miss out on a new machine or mask that could improve your therapy and comfort! Subscribe to our CPAP newsletter and get the product and industry news that affects your therapy. What techniques will help me adjust to treatment? To get used to CPAP, wear it every night without exception even if you end up taking it off after a few hours. Get into the habit of wearing it. CPAP therapy is necessary for your life. You need to make a commitment to a longer, healthier life. Wear your Mask around the house when you are first starting out. Watch TV with it on, read while wearing your mask. Getting used to the feel of the mask when you are awake will help it to feel familiar at bedtime. What Alternative Treatments and Lifestyle Changes can Affect Sleep Apnea? Usually these are things to be tried in conjunction with traditional treatments. Always consult with your doctor about any alternative treatment methods before trying them. Some people have reported that playing a didgeridoo has helped strengthen the muscles in the pharynx and upper air passage. Also, it has improved the user's number of apnic events or allowed them to lower their pressure. In obese or overweight individuals, losing weight can have an effect on their Sleep Apnea and pressure needs for the CPAP machine. Eating a healthy diet combined with exercise, can promote loss of weight and with weight loss can lead to the need for a lower pressure on the CPAP machine. It is recommended to avoid alcohol or other depressants or drugs that can adversely affect those with Sleep Apnea. Avoiding cigarette smoke or quitting smoking and avoiding other pollutants can help with irritation of the mucous membranes in the nose and air passage that may cause swelling. Trying different sleeping positions can help in some cases, especially sleeping in a somewhat upright position if one is not using a CPAP machine. Breathe Right strips might reduce snoring which is a symptom of Sleep Apnea. However, no medical research shows that these strips are effective in treating Sleep Apnea. How Do I Cure My Sleep Apnea? Can Sleep Apnea be cured? Unfortunately, there's no real "cure" for Sleep Apnea. There are treatments minimizing the impacts of Sleep Apnea through a wide variety of means, including: CPAP therapy, oral appliances, surgery, Provent and a few others. These treatments mostly minimize the symptoms of Sleep Apnea, but they can't stop the cause of the condition-- a blocked airway due to relaxed tissues of the mouth and throat. CPAP therapy works by using gently pressurized air to help prop open the muscles of the mouth and throat, allowing air to reach the lungs. As more air is able to reach the lungs, blood oxygen levels go up, and the effects of Sleep Apnea are reversed. CPAP therapy is the most popular form of treatment for Sleep Apnea. It's also the least invasive, and carries with it the least amount of risks. For this reason, more doctors prescribe CPAP therapy than any other kind of treatment for Sleep Apnea. CPAP therapy is considered a Class II Medical Device by the FDA and requires a prescription to purcahse. Provent Therapy involves putting a breathing implement over the outside of the nose. It works by redirecting some of the exhaled air back into the airway, creating extra pressure used to open up the airway, allowing air to reach the lungs. Provent doesn't work for everyone, but some apnea sufferers prefer it to CPAP therapy. Like CPAP machines, a person needs a prescription to purchase Provent. In 1995, a study was conducted to see if snoring individuals with a family history of snoring were likely to snore themselves, and looked to see if the snoring trait could be passed on to subsequent generations. The study found that Sleep Apnea has a hereditary component to it. To put it simply, snoring runs in families. While snoring isn't a cause of Sleep Apnea, it is one of the symptoms. Each person gets half of their genes from the mother, and half from their father. Since our genes contain the blueprints for the construction of our bodies, some individuals are simply born with a more narrow airway than others, or have more excess tissue in the airway. A more narrow airway or excess tissues, can cause a person to have a blockage form from relaxed tissues during sleep, and the blockage is what causes Sleep Apnea. Unfortunately, there's nothing a person can do to reduce the genetic risks of passing Sleep Apnea on to other generations, but there are treatments for Sleep Apnea. CPAP therapy is the most common. Other treatments can include oral appliances, surgery, or Provent. How Do I Manage My Sleep Apnea? Sleep Apnea is managed by finding a way for air to reach the lungs during sleep. In doing so, a person is able to get the oxygen Sleep Apnea takes away, and in the process, the symptoms of Sleep Apnea are greatly reduced. CPAP therapy is one way of resolving Sleep Apnea. In addition to CPAP therapy, there are a few other things a person can do to manage Sleep Apnea. Helpful Tip #1: Become a Side Sleeper- Side sleeping benefits CPAP users by using gravity to help open the airway, allowing a CPAP machine not have to work as hard, and lowering AHI readings for the person who does this. If side sleeping is the best position for someone using CPAP, sleeping on the back is easily the worst. When a person sleeps on their back, gravity works against a person, causing the airway to collapse even further than it otherwise would. Changing from sleeping on the back to the side, can make a big difference for a person suffering from Obstructive Sleep Apnea. Helpful Tip #2: Stick With It- Sticking with CPAP therapy for the long haul is the only way a person can recover from the impacts of Sleep Apnea. CPAP therapy will take a long time to get used to, and there's no way around it. Eventually, a person can adapt to CPAP therapy and reap the benefits of treating the condition. Not treating Sleep Apnea can expose a person to increased risk of heart attack, diabetes, stroke, and high blood pressure. It's not a condition that can be ignored forever before the problems it causes will have an impact on a person's health. It's more important than ever to stick with the treatment plan prescribed by a physician. According to the American Sleep Apnea Association, approximately 1% to 4% of children experience pediatric Sleep Apnea. Studies have found Sleep Apnea to be responsible for ADHD-like symptoms in kids. Treating Sleep Apnea can lead to a reversal of those symptoms, often without additional medications. If a child is snoring, thinking the child will eventually grow out of it could result in lots of lost productivity in the time it takes for this to happen. Sometimes the source of the problem is large tonsils, and it can be fixed with simply undergoing surgery. Sometimes CPAP therapy is necessary, and when Sleep Apnea is properly treated a parent can sometimes notice an improvement in daytime attention and possibly behavior. In order to get a child treated for Sleep Apnea, one should consult a pediatrician specializing in Sleep Disorders. Apnea in Greek, literally translates "without breath"
Sleep Apnea in children has been loosely linked to Attention Deficit / hyperactivity disorder, ADHD. CPAP therapy is the most common way to treat Sleep Apnea. Continuous positive airway pressure for treatment of postoperative hypoxemia: a randomized controlled trial. Reduction in motor vehicle collisions following treatment of sleep apnoea with nasal CPAP. Association of sleep-disordered breathing, sleep apnea, and hypertension in a large community-based study.